Flickr is probably the best known on line photo managment and sharing site. It’s free to sign up for an account, and you can start uploading digital photos within minutes. There are limits for the free account (Only the 200 most recent uploads are shown, with limits on how much can be uploaded per month) but upgrading to the Pro account is only US$24.00 annually. Whilst primarily for photos, since April 2008 video uloads of not more than 90 seconds are allowed. Besides being able to upload photos, tagging plays a big part in bringing related photographs and their owners closer together. Early subscribers also began to use tagging to geolocate their photographs, using longitude and latitude values. Flickr has made geotagging much easier by offering a “add to your map” link which uses a draggable map to automatically generate your geotags without having to know the longitude and latitude of the location. A very mature api has seen some useful third party applications. 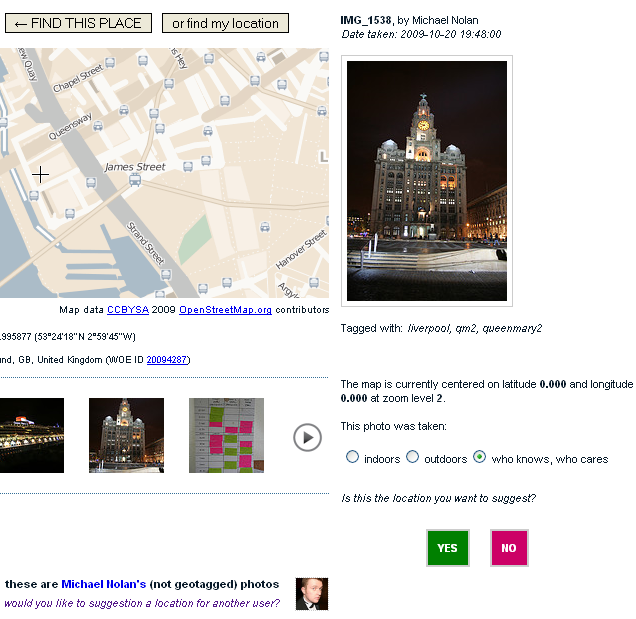 Suggestify (currently in Alpha release), uses geotags and flickr‘s api to enable subscribers to suggest the geolocation of a photograph not owned by themselves. Suggestify then “tries” to post a comment on that photo with a link to the Suggestify site where the suggestion is stored. The owner can either opt out or accept and the photo is geotagged. If you twitter (oh yes), try following @dailyshoot. dailyshoot posts a daily assignment which is easy enough for anybody to have a go at. There is a flickr group for assignments – an easy way to view other entries. Noticings keeps a record of your scores so that you can see how you’re getting on. It also has a superfluas twitter account: @noticings. The Flickr code team are particularly excited about this one. Anybody know any better ones?